Ogden on Politics: State Senator Mike Delph Does the Right Thing; Will Other Politicians Follow? 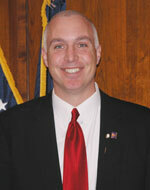 State Senator Mike Delph Does the Right Thing; Will Other Politicians Follow? Yesterday Senator Mike Delph made headlines by being one of the first Republicans to agree to return campaign contributions from recently indicted Tim Durham. Delph had received $10,000 from the embattled financier now accused of defrauding hundreds of investors to the tune of hundreds of millions of dollars. Actually the first was Marion County Sheriff candidate Tim Motsinger when learning of the accusations against Durham, immediately agreed to return the money even though doing so had the effect of ending his campaign. Still others stubbornly refuse. Governor Daniels, who has received nearly $200,000, won't even consider returning the money saying it has been spent. Former Marion County Prosecutor Carl Brizzi has refused to return his $200,000 as well even though his campaign committee recently filed showed him plenty capable of returning that money. Attorney Greg Zoeller has indicated, pending the verdict, he's putting his Durham money in a "segregated account," whatever that means. Democrats too also received contributions including former Mayor Bart Peterson who hasn't offered to return the money he received. Republicans and Democrats should be moving heaven and Earth to find a way to return Durham contributions. Although it will amount to only pennies on the dollar for those Fair Finance investors many of whom lost their life savings, it is the right thing to do not only on a personal level but politically as well. If Gov. Daniels truly aspires to run for President, his refusal to return contributions from Durham will never go away as an issue. Do the right thing, politicians. Give the money back. Mike Delphs is a class act. We need more like him. Mike Delph may be a nice guy, but his political views make my stomach hurt and my bile boil over. Still, this was the right thing to do. I'm glad giving back the money was part of Delph's political views. Too bad none of the others follow suit.